Hayate the Combat Butler! Girls GRAPHICS Hata Kenjirou Illustrations is a really out-dated collection of illustrations. 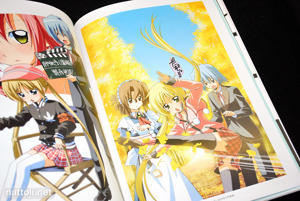 Released to coincide with the film premiere of Hayate the Combat Butler! Heaven Is a Place on Earth, Girls GRAPHICS seems set on invoking your nostalgia for the series, but not as eager to impress you with newer works. Girls GRAPHICS Hata Kenjirou Illustrations is A4-sized and 160-pages long. 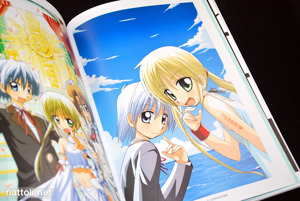 The cover illustration of Nagi has a relief plastic texture similar to a sticker, and was newly illustrated for the art book. There's an illustration of Maria on the back cover that's done in the same way too. Some of the other physically unique features in the book are a few clear acetate pages along with an attached booklet of leaflet comics. You can see one of the clear acetate pages in action above. They're just placed against blank white pages so it does seem a little pointless, but it's a nice addition since it's not something you see often in art books. The book starts out with Characters for CD Graphics, which runs for 17-pages and features exclusively background-less illustrations. The next section, Variety for Goods & Pin-Up Graphics is 9-pages, with most of the images being centered on the page and a little on the small side. Scene for DVD Graphics includes the illustrations Hata Kenjirou did for the anime DVD boxes and OVA. It's also 9-pages long and includes one of the acetate page illustrations. There's also a two-page spread in this section, and unfortunately, they're not printed with overlap in this book. That section is followed by the Comic for Poster Graphics, which is a short 5-page section that includes single comic pages. 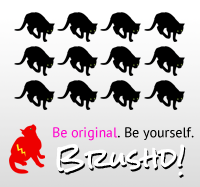 Not really suitable for an art book. The Vivid for Color Page Graphics I section runs from pages 49 through 63, and includes the illustrations that were in Shounen Sunday (少年サンデー) from as far back as 2004. Though it may be a little hard to understand from the photo, that's the insert leaflet comic book that I mentioned earlier. It's A5 sized, like the manga, and still features the original advertisements that were printed next to the comics, as the comics sometimes make references to the ads. And yes, including the advertisements, that counts as your pages 65 through 96. That's like counting the commercials in your run time on a DVD. Next up is Season for Cover Graphics which includes the art used on Shounen Sunday covers on pages 99 through 115. The majority are full page illustrations, though there are a couple half-page ones as well. There's also a section called Sensuous for Card Game Graphics, which contains the illustrations for the Hayate the Combat Butler! TCG. This section also includes two-pages of acetate illustrations, both of the same image but with slightly different coloring. 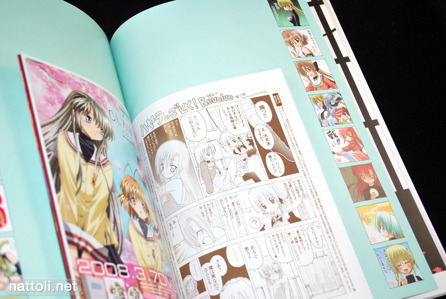 The last section is Vivid for Color Page Graphics II and includes more Shounen Sunday illustrations. The book ends with a 4-page interview with Hata Kenjirou that's laced with even more illustrations. 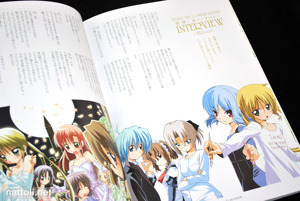 There isn't an index in this book, as all the image information was included in the surrounding white borders. Overall, Hayate the Combat Butler! Girls GRAPHICS Hata Kenjirou Illustrations is a pretty well-made book with a lot of decent content, but that comic leaflet being counted as 30-pages of this 160-page art book really soured things for me. Thank you for this review. 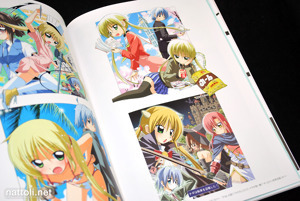 I didn't know such a nice Hayate artbook exist. Thanks for the review. There are not many HnG artbooks, so I might have to pick this up for Xmas. I've bought this artbook in one of the Animate stores, during my second trip to Japan, in 2014. 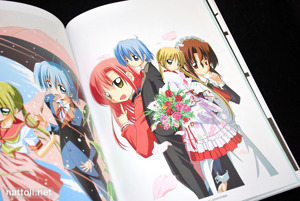 It's really interesting how I hated Hayate, the Combat Butler at first, but later became really fond of the series.